Awite – Business Joomla Template website template with product showcase. You can use it for portfolio sites, business, corporate, product catalogue, online marketing or services websites. You can easily re-brand your template by using our homepage layout design options as starting point and create any background style or content style you want. Awite Joomla template is a custom design, clean and modern website template built for flexibility. This template builded with HTML5, CSS3 and Bootstrap 2.3.2! 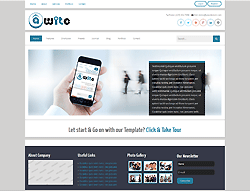 Awite Joomla template comes with many layout for business, portfolio or similar websites. Awite is a fully responsive (compatible all mobile devices like: tablet, mobile phone, laptops etc).